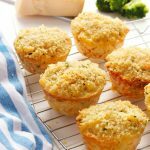 By adding chopped broccoli to baked mac and cheese, this mac and cheese muffins recipe is a great way to get veggies in, virtually unnoticed! Preheat your oven to 350 degrees Fahrenheit and grease a 12-cup muffin tin with some canola oil spray. Add the milk, eggs, and salt and pepper to a large bowl and whisk them together well with a fork. Stir in the grated cheeses, the chopped broccoli, Worcestershire sauce and sriracha. Cook the macaroni according to the package directions and rinse it under cold water. Add the 3 cups of cooked and cooled macaroni to the bowl with the milk and cheese mixture and stir well to combine. Spoon the mixture into the muffin cups, dividing the mixture as evenly as possible. In a separate bowl, stir together the panko breadcrumbs, dried parsley, and salt and pepper. Spoon the panko mixture over the muffins and drizzle the melted butter over everything as evenly as possible. Bake the muffins at 350 degrees Fahrenheit for 22 to 25 minutes, or until the tops are beginning to brown. Let the muffins cool in the tins until they're almost completely cool (this will ensure they stay together) and enjoy!